According to a recent ReefBuilders story, the Freshwater and Marine Aquarium Magazine is going to cease to be in existence. BowTie, Inc., the company that publishes Freshwater and Marine Aquarium Magazine and several other magazines, will be combining FAMA with Aquarium Fish International. 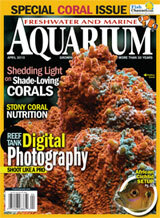 The June 2010 issue of Freshwater and Marine Aquarium will apparently be its last. This is very sad, as yet another aquarium publication has gone down the drain, and I subscribed to this one too!